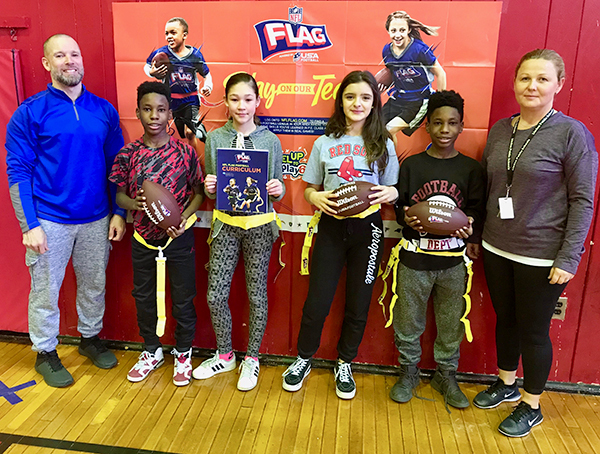 McManus Middle School in Linden has been awarded a grant from the NFL Play 60 organization to bring the action and activity of flag football to physical education class. McManus got 50 flags, 10 footballs, four kicking tees, and a curriculum book. The flags are worn around the waists of players, and a player is considered “tackled” when another player pulls off his or her flag. Migliore explained to his students that the school has to put a priority on buying equipment that can be used year-round, unlike flag football equipment, which they will use for only part of the year. Migliore said he applied for the grant at the end of the last school year, and learned in November that McManus was awarded the grant. Classes will begin using the equipment in the spring, once they start going outside again. “When I showed them we got flags, they were dancing around and they were happy,” Migliore said. “They were saying, ‘I can’t wait for the spring when we can go out and play!’ So they’re going to love it. “I can’t wait, because I play steady quarterback sometimes! I can still throw it a little bit,” he said with a laugh. NFL Play 60 is a national youth health and fitness campaign focused on increasing the wellness of young fans by encouraging them to be active for at least 60 minutes a day. Over the past decade, the NFL has partnered with leading organizations to help children of all abilities lead healthier, active lives. (above) Students at McManus Middle School in Linden checking out new flag football equipment the school received through a grant from NFL Play 60. (l-r) Physical education teacher Patrick Migliore; seventh-graders Ashton Armstead, Michelle Gasior, Gabriela Grzebyk and Ryan Armstead; and physical education teacher Emilia Milewski.